Fight the Monday blues by kicking off the work week on a sweet note. Hollywood Tavern in Woodinville is serving up one free dessert per table every Monday! 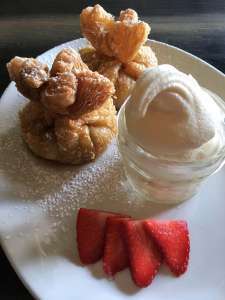 Hollywood Tavern offers large, shareable desserts, such as Apple Blossoms ~ fried apple pie puff pastry with an apple glaze, served with soft serve ice cream. Other shareable desserts include, Meyer Lemon Pie, Hollywood Sundae & more. This special offer runs every Monday, now through March. Hollywood Tavern is open on Mondays from 11:00 am – 10:00 pm.